I hope that the photography in this blog keeps improving over the coming months and years! In 1864, when Lincoln made the land grant creating what would become the first national park, the grant included the Yosemite Valley and the Mariposa Grove of giant Sequoias. At the time, the giant redwoods were being cut down to make grape stakes, charcoal and pencils (the wood was not good for building, unlike that of the coastal redwoods). 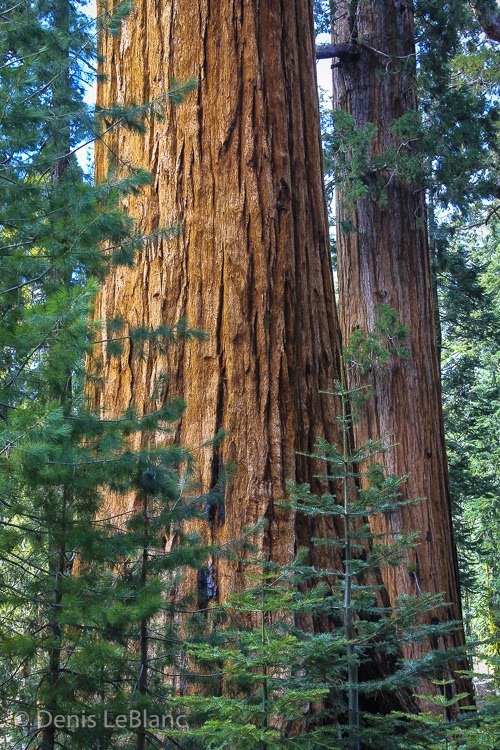 Luckily, as many as 65% of the giant sequoias that had survived into the European settlement era were eventually saved in Sequoia, Kings Canyon and Yosemite National Parks. Can you find Lynnae peeking through this uprooted root system? 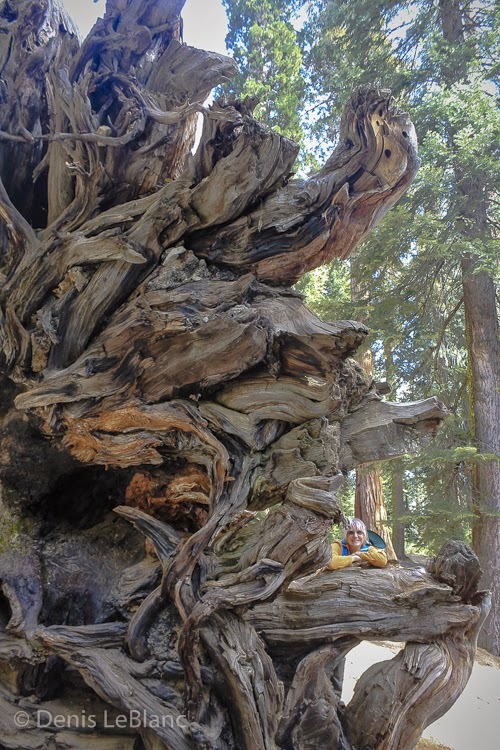 Mariposa Grove is the largest grove of these magnificent trees in Yosemite. There are about 500 giant redwoods scattered across a couple square miles in this grove and many of them are simply amazing. These are the largest trees in the world, measured by bulk, and some of the oldest (1,800 to 2,400 years old). The coastal redwoods are taller and other trees are bigger around, but these trees take on a unique nobility of form and color as they pass about 200 year old. The lowest branches are usually quite high and the tops lose their pointed “evergreen” look and develop great character. Wandering in a grove of these trees is humbling. Our plan for the day sounded promising: drive up to Glacier Point, have lunch at the viewpoint, do a moderate hike, have dinner at the point, watch the sunset and wait till the stars come out to see them in dark sky glory. We ALMOST did it all. After a quick lunch, we tucked Tucker into the truck to sleep and we hauled out on the Panorama Trail. Though the trail goes all the way to Nevada Fall and down to the valley (8+ miles), we were just going to hike to Illilouette Falls, then a mile or so up to Panorama Point, then back—2,000 vertical feet and about 8 miles round trip. It turned out to be a fabulous hike, with great views of Vernal and Nevada Falls, a bridge over fast-rushing Illilouette Creek just above the falls and another great view of Yosemite Falls from the point. 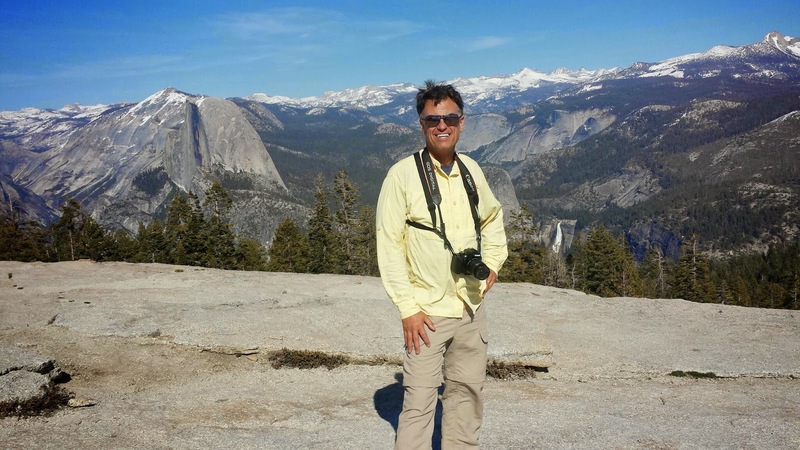 It is amazing to me that for all the tourists flocking to Glacier Point, we saw maybe 10 people during the whole four hours of hiking, and most of these seemed to be European visitors. If the park had a “drive-through” vista point, I’m sure half the people would use it and never get out of their cars! We got back to the truck, let Tucker out of jail, grabbed all our clothes and dinner stuff and trudged off to the very tip of Glacier Point. 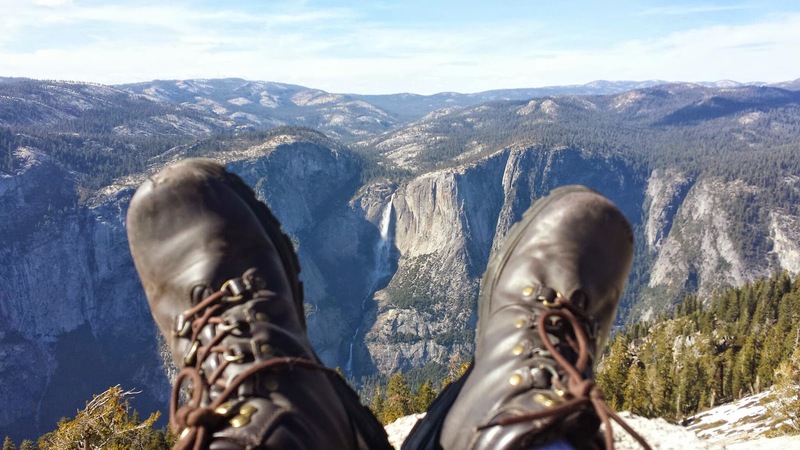 From up here we could see the valley spread out 3,000 feet below and up Yosemite valley past Half Dome and out to the snow-capped rim of the world across to the east. 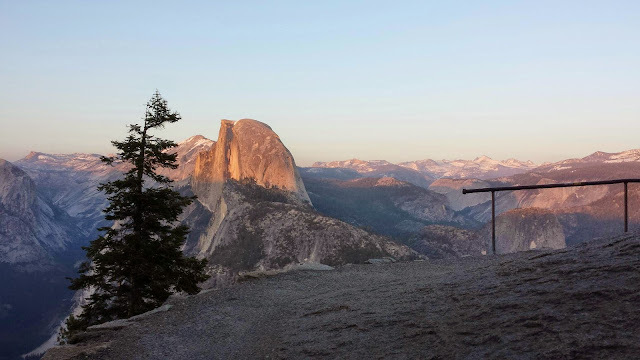 As we waited for sunset with several other die-hards, many with camera tripods waiting for the sunset light on Half Dome, we felt the cold set in (we were at 7,200 feet). We drank our ice-cold beer and ate our cold tuna wraps. By the time the sun set (which was beautiful but not spectacular, there being no clouds to give us the fiery light) we were frozen to the bone. We gathered our stuff, trudged back to the truck and settled in with the engine idling and the seat heaters on high to wait for darkness. After 20 minutes of this, we decided a warm trailer trumped the stars and headed home, having accomplished 4/5 of what we set out to do. Seeing the stars from Glacier Point would have to wait for another attempt, but the day was a big success anyway. Inquiring minds may want to know a bit more about how we live, day-to-day. Our routine varies depending on where we happen to be, but there is a structure to our days that holds pretty true when we aren’t on a traveling day. 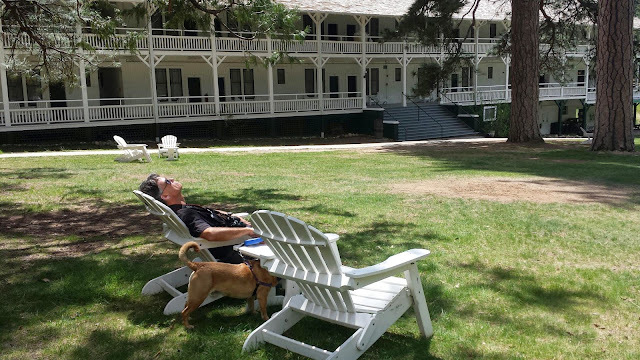 I’ll describe a typical day of boondock camping (no water or electric hookups) here in Yosemite. We usually read or putter or write on the blog for a few hours, then make a big salad in to-go containers to pack for a hike. Around 10 or 11, we change into shorts and throw lunch and our packs into the truck and drive to a trailhead. 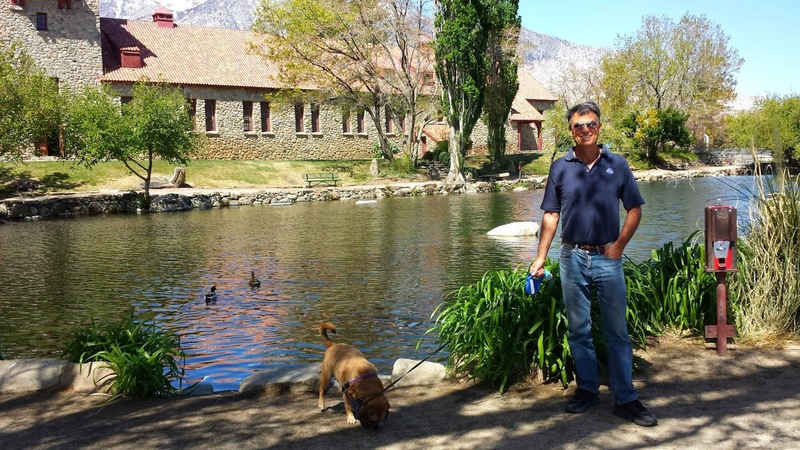 We’ll usually pick a hike from 3 to 5 hours, maybe 6 and eat lunch on the trail. We might take Tucker or leave him to his beauty sleep. Arriving back at the trailer around 4, we spend the next few hours having a beer, taking a shower and fixing dinner. Dinner will be eaten outside if nice or inside if cold and might be enchiladas, pasta with vegetables, grilled fish and vegetables, or our favorite--fish tacos. After dinner we might have a fire outside and retire early or read or turn on the inverter and put on the TV and watch an episode of whatever series we are watching (right now it’s House of Cards, season 1). We are usually in bed by 9 or 10. We’ll usually alternate hiking days with in-camp days where we get to putter more, ride our bikes, draw, mess with photograph files, etc. We usually eat out every week or 10 days, more if we are near a city, but we cook and eat well at home and are more often disappointed by the restaurants we find. We might do a museum or historical site instead of a hike and sometimes there is project work to be done around our rig (there’s ALWAYS something to fix or improve; I’ll write about my solar electric project some day). There is periodically some forward travel planning we need to do. 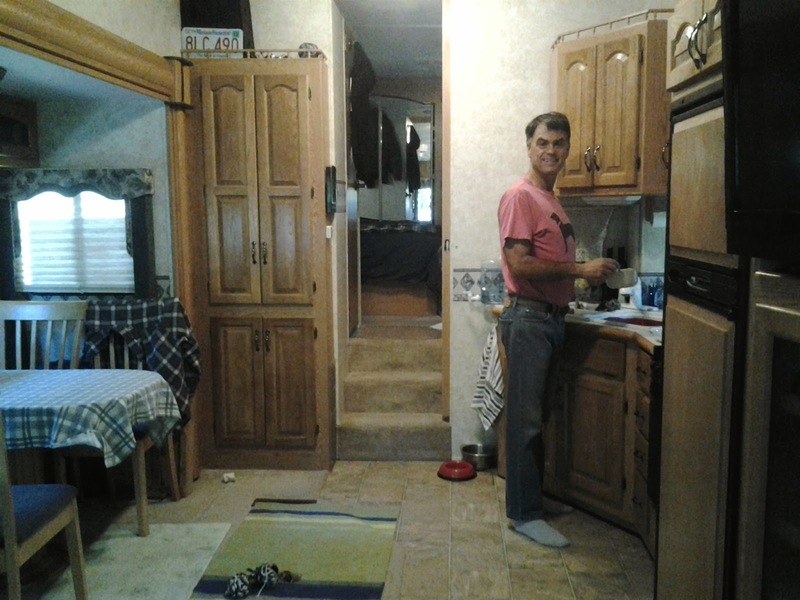 Once a week or so is laundry and clean up the trailer day, but for our small place, cleanup takes only an hour or so for the both of us to do. That’s it! Life is pretty simple, and without a house or jobs or kids at home or much responsibility we have a lot of time to read and ponder and appreciate whatever our surroundings may be. We are so grateful. Yosemite is a place that is dear to our hearts. I camped in Yosemite a few times back when I was in college and when Lynnae and I were first dating, she invited me to join her and her friends for a long weekend camping in Yosemite valley. We returned several times and eventually brought both of our boys here when they were little. We flew out as a family in 2001 and that was our last time in the area. So 13 years later we get to return and spend SIX WEEKS in this most beautiful place—Lynnae’s favorite place in the world and one of my top 5. 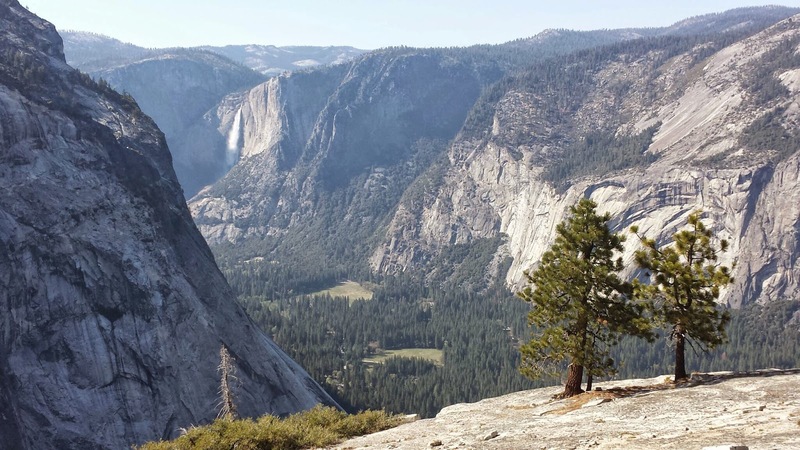 Next year Yosemite will celebrate its 150th anniversary as a public park—Abraham Lincoln signed the law making Yosemite valley and the Mariposa grove of giant sequoias protected in 1864. It is amazing to me that in the middle of the darkest days of the Civil War, Lincoln found time to create the first national park. 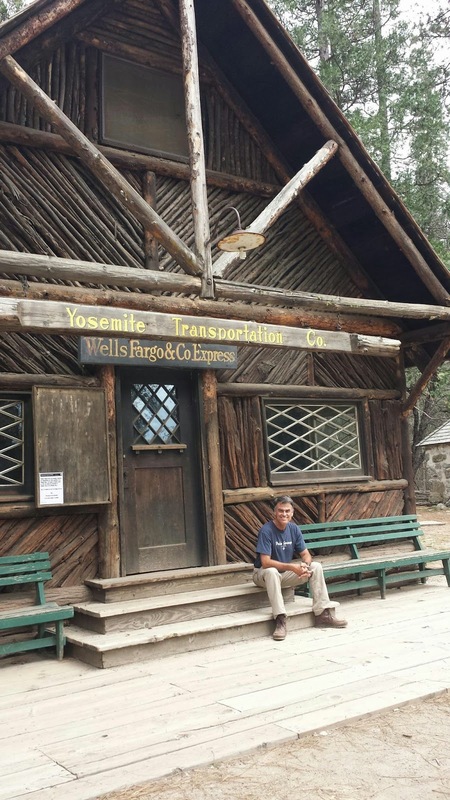 We are staying in the Wawona area, near the south entrance to the park and about an hour’s drive from the valley. Our campground is among the tall pines and cedars along the rushing South fork of the Merced River. 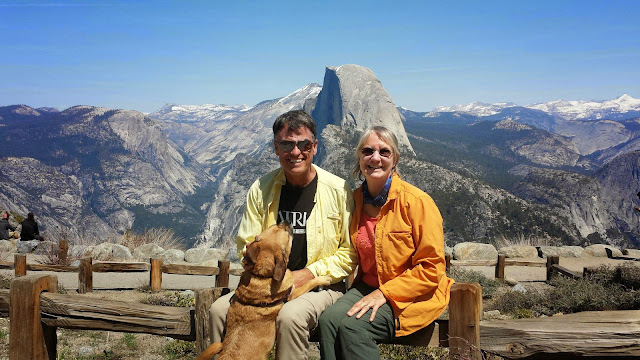 We want to slowly get to know more areas of the park, so for the week we’ve been here, we have not even driven into the valley, but have hiked the Glacier Point area and a few other hikes near Wawona. Pictures below! Mt. 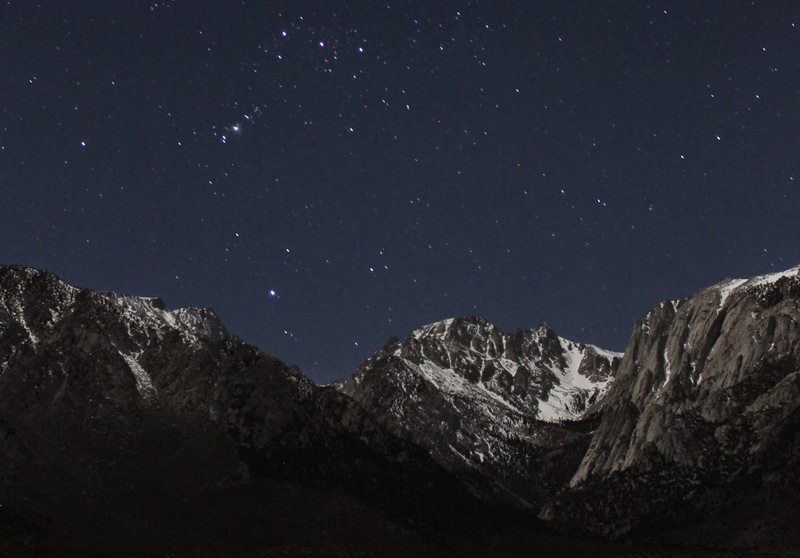 Whitney is the tallest mountain in the lower 48 states and a very popular climb. Leaving from Whitney Portal it is a 21-mile round trip hike with 6,000 feet of elevation gain. Most people take 3 days to do it and once the snow melts, the climb does not require technical climbing skills. But we aren’t going to do that hike for a couple of reasons: it’s too early in the season, still lots of snow; we don’t have backpacking gear; but mainly because we are wimps. 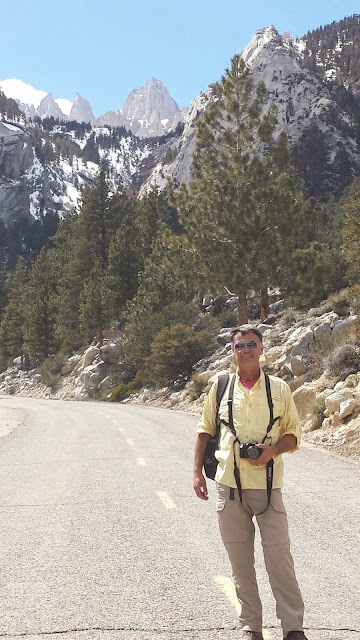 But we did do the hike up TO Whitney Portal because the road from Lone Pine campground is still closed for the winter. There is a great 4-mile, 2,500 vertical foot trail that give some great views of Mt. Whitney and the Alabama Hills below and we took most of one day to do that. We ran into some hikers who did try to reach the summit the day before, but were chased off the mountain by a big thunderstorm. These people were impressive—29 miles round trip, 8,500 feet of elevation gain, much of it IN THE SNOW! Makes me want to put my feet up and have a beer just thinking about it. 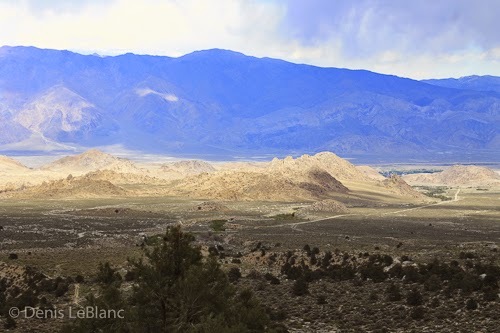 After four nights camping among the rocks of the Alabama Hills, we decided to move. The main driver was needing to get internet access and getting tired of feeding the meter at the Lone Pine espresso palace--our bladders just couldn't take any more coffee! 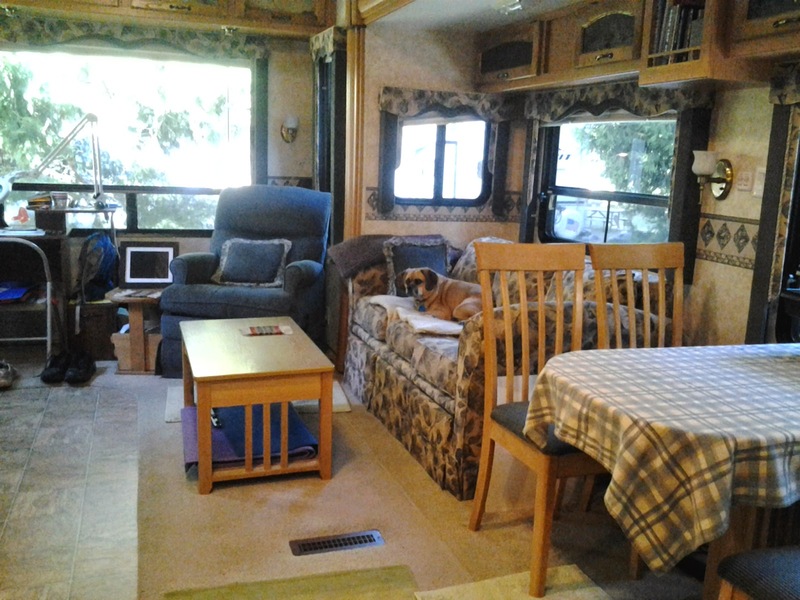 So we pulled in our slide-outs and battened down the hatches and moved three miles south and closer to the mountains in a Bureau of Land Management campground called Tuttle Creek. Not only did we get 4G and cell coverage, but we found fabulous fishing right in the creek that runs through the campground and were also treated to some fabulous 360-degree views. So now we've had trout three times this week (I claim no credit for this, Lynnae is the fisher-person, but I did clean some of them!) 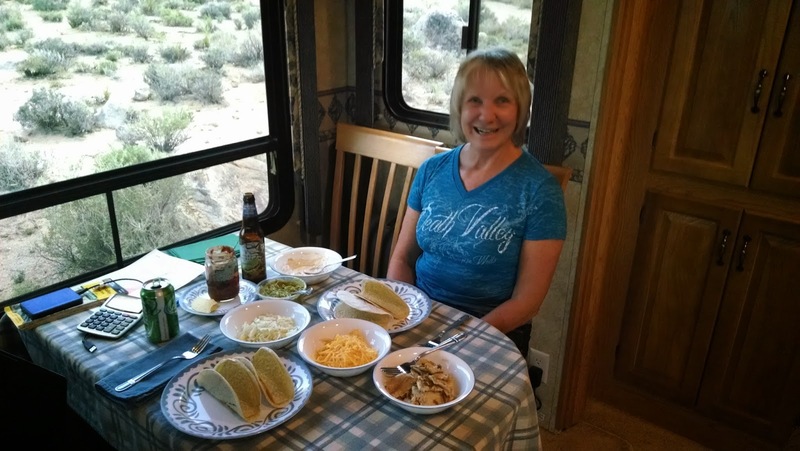 As some of you who follow us know, fish tacos are somewhat of a theme and a purpose for our travels and tonight we had perhaps the best yet--trout tacos! A few days ago we hiked up our little creek into the mountains above. We went about 8 miles round trip and climbed from our 5,000 foot level to about 7,500. It was spectacular, and Tucker loved it too! The lake is essentially a dry salt flat that blows toxic dust containing heavy metals as far as Utah. It is the largest single source of dust pollution in the country. The little bit of blue you see in the middle of the picture is the paltry amount of water that the courts just recently FORCED the city to allow to flow down to the lake to try to mitigate some of the toxic dust and rebuild some wetlands. 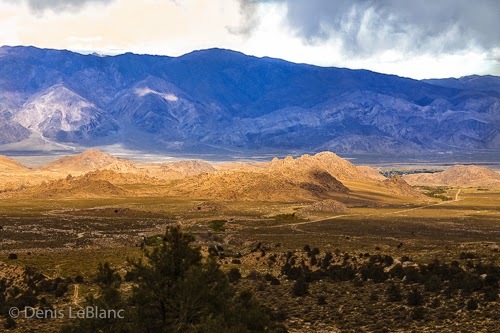 The Owens Valley is basically a place people drive through to get to Lake Tahoe from Los Angeles, but one wonders what the valley would be like if it still had its water. My interest in photography has been steadily growing as I get further from my "working" life and we fall deeper into this traveling life. We are seeing so many wonders that I have to try to capture the essence, the feelings that these places evoke. So I've had my Canon DSLR for about three years now and 95% of the pictures I've taken are with the camera set on P (full "auto"). I have been really clueless about how to use the literally hundreds of combinations of settings that this camera has. Finally, I downloaded a full users' guide for the camera and have spent the last couple weeks, starting in Death Valley, learning how it all works and trying to use more of its capabilities. And today I downloaded some software from Adobe (Lightroom) that will let me organize, correct and enhance the photos I've taken, so stay tuned for some improvements and hopefully some links to more of my photo libraries for those who want to see more than just the few shots I put on the blog posts. All that is by way of introduction to these shots. I have been awestruck by the effect of the moon lighting on the snow-covered mountains near us and have been working on capturing that. I finally have some that do these beautiful nights justice. We visited the historic Mt. Whitney fish hatchery and loved the building but were disappointed to find out that they don't actually raise fish there any more since a big fire and flood in 2008. 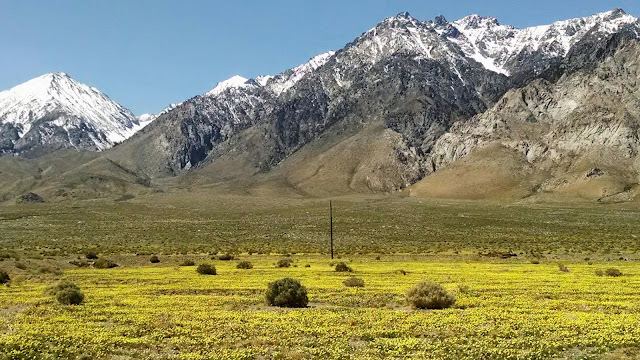 Driving through Independence from the fish hatchery we saw this field of yellow at the base of the Sierras! 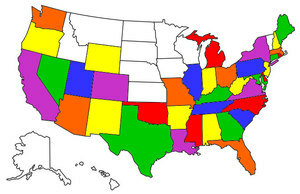 In 1942, over 100,000 Japanese immigrants and US citizens of Japanese descent were ordered to 10 interment camps, where most of them would stay for the duration of World War II. One of the first and largest of these camps, Manzanar, was located just north of Lone Pine. Over 10,000 people were herded here and during their imprisonment, they built a community as best they could. Initially housed in hastily-assembled barracks of wood and tar paper, the people built gardens, grew vegetables, made tofu and soy sauce by the barrel full, built beautiful furniture from fruit crates--essentially did what you would expect the Japanese people to do when forced to fend for themselves. 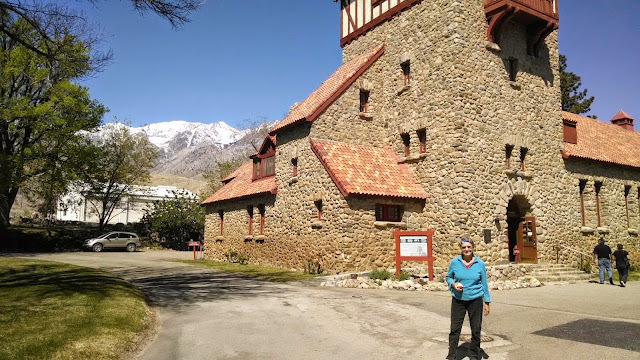 We visited the Manzanar site, now a national historic landmark, and listened to the dozens of personal histories and accounts recorded over the last several years. This was a very moving and unique experience. Not called a concentration camp, the barbed wire and guard towers must have made Manzanar feel like one. A very sad time in our history. The buildings having been sold for surplus during the housing shortage after WWII, nothing much remains but the signs showing the location of the hundreds of barracks, each of which housed 24 people in three 20 x 20 rooms. A sad and ironic story. Remains of a baseball field, popular with the residents. Remnants of the Japanese garden created by the inmates, over 400 of which were landscape gardeners by trade.